Commissions can be the mainstay of an artist’s income, however how to go about negotiating or making a commission can often be daunting or a tricky task. Because of this Alexandra Gould and Stephen Fox have come together to discuss in detail the process they went through together during the commission of ‘Cornerstones’. 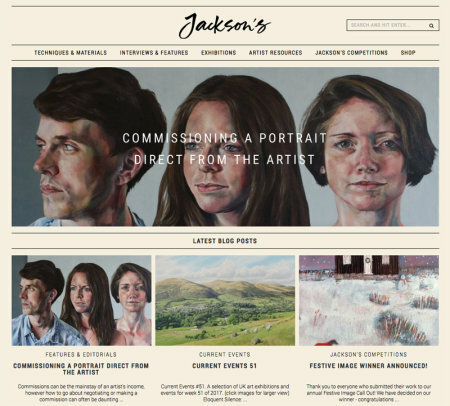 From both the side of the artist and the side of the patron, what they have said gives some great insights into how you can negotiate the commissioning of a family portrait from start to finish and how negotiating commissions can work. Alexandra Gould is a British portrait painter living in Corsham, Wiltshire. Stephen Fox is a Director of a successful London business and has recently embarked on a new endeavour to support lesser known artists particularly those in the South West. Here we discover how together they negotiated the commissioning of a family portrait from start to finish. Stephen, what inspired you to commission a portrait? How and why did you choose the artist Alexandra Gould? SF: I have always wanted a portrait of my children. We have thousands of photos that are meaningful, but remain what they are, amateur references to the family that everyone has to some degree or another. I wanted a point in time transfixed and totally original that becomes part of the family heritage and hopefully is greatly valued and cherished by the descendants of the Fox family. I truly forget now how Alex crossed my path at the time I was ready to do this endeavour. But she did and I checked out her website called her and the rest is history. I did no other research. I loved her style, I felt she understood what I wanted to achieve and I was convinced my children would feel the same. I invited my eldest daughter only to accompany me on this brief and she felt the same about Alex. Alexandra has been painting professionally since 2016, what advantages were there for you in encouraging a new emerging artist to paint your family? SF: There was probably far more risk than advantages. But that was not an issue. I wanted her to do the portrait simply because I believed she would create something wonderful and original. You must have faith in the artist. There is no point in commissioning anybody if you have practical and/or emotional doubts about them or their artistic capability. I had none. Why choose a painting instead of a photograph – what can the painting deliver that you felt a photograph couldn’t? SF: It is not simply the camera’s interpretation of the subject, it is another complex human being seeing your children in a way you never would. A person who does not know your children and has no history of them, but uniquely sees them in their own mind and eye. How did you agree on the details of the commission? Can you talk me through this process? AG: Across emails I described how I normally paint, the size and type of canvas and the materials I use. I also emphasised flexibility in the process. I felt it was important to create a portrait with Stephen, reducing the formality of the process. However as a business arrangement where money is exchanged it was also vital to define expectations. How did you discuss the price and did you enter a written contract? AG: Stephen asked for the price of a commissioned portrait at the very beginning. This became the starting point of establishing what he wanted from the experience and what I could deliver. After discussing requirements and the number of subjects I quoted a price, which we then negotiated. I imagine this is part of the process for many artists as there is a balance between valuing your artwork, delivering a service and product but also the fantastic opportunity to work with some one who has belief in your art. Once a price is agreed the structure of deposits and subsequent payments is very straightforward. We agreed on a deposit following the first sitting and full payment on delivery. I normally get a signed contract for commissions as it gives reassurance that it is a professional exchange and protects both parties. My written contract outlines specifics such as size, medium, a description of the portrait to be created and the payment structure. It specifies an unframed painting and that the client is familiar with my style and wishes to have a portrait in that style. A section states that copyright for the image remains with me, the artist and payment is specifically for the original artwork. It also reserves rights to show the image online in my portfolio and for press etc. I offer a warranty that I will work professionally and that future responsibility for the changes in the painting from climate, shrinkage (or other events that happen to paintings over time) are not the artists responsibility. Finally I add a clause that if 30 days after the sale the client is not satisfied with the work I will endeavour to fix the problem and if no resolution can be found, that on receipt of the painting I will refund a third of the payment. We had already developed a relationship of trust and while we both had sight of and acknowledged the contract via email, in this instance we didn’t feel it necessary to sign and exchange copies. That is unusual. How long was the commissioning process from start to finish and how many sittings were there? AG: Tentative conversations began in early May about what might be possible and what it might cost to paint a portrait of three adults. Due to busy schedules we decided on one sitting mid August focusing on getting to know Lucy, Amy and Charlie and taking photographs for the final composition. Ten weeks later the portrait was finished. It is unusual to see a painting of three sitters – how did you respond to this commission? AG: I was very excited about the challenge, not only painting three adults each with a distinctive character to captured but also the challenge of creating a new composition. Inspired by Hannah Gluckstein’s ‘Medallion’ I wanted to maintain the close proximity but create distinctions between them as siblings and their futures that lay ahead. After meeting them I also found it helpful to title the work ‘Cornerstones’ to focus my feelings about the painting. As adults looking towards their own lives and futures, I felt that their clear love and affection for each other was a defining feature of their relationship. Alexandra, how did you gain the sitters confidence? AG: Partly by being confident in my work and abilities but largely by being open to discuss any aspect of the work or my style and responding to the sitters, encouraging them to be themselves and therefore part of the process. I often start with a sketch but as this was to be painted from my photography, I felt the time together was best used for discovering and understanding. I think the sitters found this reassuring as I wasn’t just looking and it made clear that this was to be a personal painting. Stephen, how did your family respond to your request for a portrait of them and to be depicted by an artist they hadn’t chosen? SF: Overall excitement and anticipation. I allowed them to get to know Alex and view her work online and they had a total commitment to her and her work. If they hadn’t I would not have proceeded. It would have been pointless to. How did you communicate during the commission and did you share progress at a studio visit or on online? AG: I decided to email weekly photos in addition to sending the initial sketch. Although the commute to Corsham from London is only 90 minutes, a studio visit is difficult to schedule and is largely impractical. A photo can’t do justice to a painting, but it is a great tool for sharing the work as it develops and was instrumental in getting Stephen’s feedback. I found that taking photos of details rather than the whole focused feedback and allowed for a reveal, hopefully keeping Stephen excited by the experience. Did you have support in your decision making and how did you influence the portrait? SF: I had total support from the children, but Lucy was the only member to see what I saw as the painting progressed. I was not prepared to have 4 opinions that might have confused Alex and belied her input into the painting. Our influence was minimal. I do not pay the piper and play the tune myself as the phrase goes! How were concerns raised if any and did you plan for changes to be made if the painting wasn’t as expected? SF: Lucy and I looked at the references sent through by Alex and if we had any concerns we discussed together and then I took them to Alex. Frankly, we had so few it was never an issue. It is a very striking portrait do you feel this is flattering or a realistic depiction of your children? SF: It is neither flattering nor totally realistic. It is an interpretation of my children’s features that could never be created on film. But it is an interpretation that creates immediate comment and emotion. I am sure some will criticise and they may, but they cannot experience the same emotions as I and my children would have looking at the painting. They will be objective, we are too involved. It is an extraordinary interpretation of my children. Is commissioning a portrait a rewarding experience? SF: Totally. It’s a unique human experience. Would you commission a painting again or sit for a portrait yourself? Is there a place in today’s art market for a patron of unknown artists? SF: There’s a place for a patron (s) to support artists who are avoiding the cliché or the norm and who are brave enough to stay true to their art despite criticism or low interest. Yet they are creating art that is forming its own niche, albeit sometimes a miniscule niche, in a world that celebrates mass conformity to what is ‘acceptable’ and ‘affordable’.